Jones bill would require Department of Defense to justify "national security tariffs"
A bill proposed by Sen. Doug Jones, D-Alabama, and a group of bipartisan senators would require the Department of Defense, rather than the Commerce Department, to justify national security tariffs. Congress would also be able to kill the tariffs by passing a motion of disapproval. Jones is sponsoring the bill with Ohio Republican Sen. Rob Portman, Iowa Republican Sen. Joni Ernst, Republican Tennessee Sen. Lamar Alexander, Democratic California Sen. Dianne Feinstein and several others. The Trade Security Act would reform Section 232 of the Trade Expansion Act of 1962, the law that allows the president to implement tariffs to protect national security. President Donald Trump has used the provision to justify tariffs on steel and aluminum imports. Jones and Alexander have repeatedly urged the president to reconsider the tariffs. 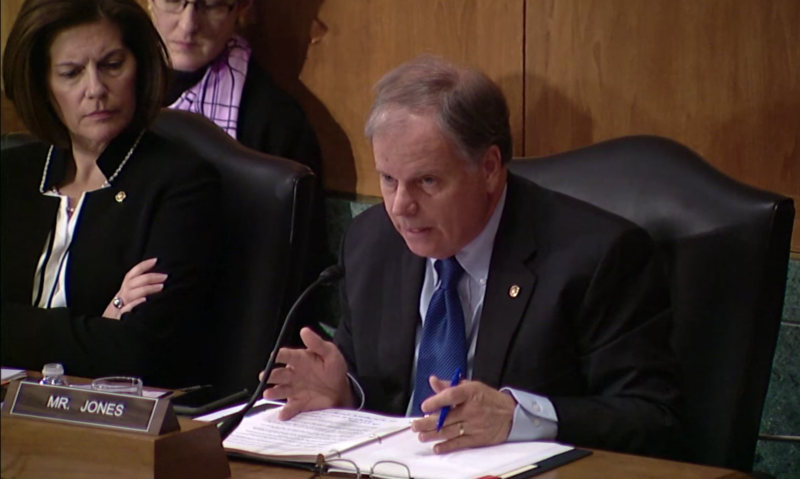 The two senators have said the tariffs are negatively affecting Alabama and Tennesse’s automobile industry, which heavily relies on imported steel and aluminum. Trump’s administration has argued that the tariffs protect domestic steel and aluminum manufacturers so they can remain in business to supply metals to the military. Portman, who has also expressed concerns about possible misuse of Section 232, said the tariffs have impacted jobs in Ohio and the U.S. as a whole. Retaliatory tariffs have threatened Alabama’s agriculture industry. China purchased about 60 percent of U.S. soybean exports last year. With those exports tumbling because China’s retaliatory 25 percent tariff on soybeans, prices have dropped and sent farmers into a tailspin. Exports of soybean, one of the top 10 agriculture exports in Alabama, to China dropped nearly 94 percent last year. The U.S. arrived a truce with China in December on some of the tariffs, but it isn’t clear how long that will last. The 25 percent tariff on soybeans remains in place. The bill appears to strip the president’s authority to initiate Section 232 tariffs unilaterally. Under the new bill, if a threat is found, the Department of Defense would send a report to the president. If the president wants to take action based on that finding, they would then direct the commerce department to develop recommendations for how to respond. At that point, the president could decide whether to take action. The president would also be required to “consult” Congress throughout the process, and Congress could pass a joint resolution of disapproval to block the tariffs. There is also a disapproval measure in the existing law, but it only applies to oil imports. It was inserted in 1980 in response to concerns about misuse of the statute. Tariffs on any type of product could be blocked by congressional action under the new bill. Sens. Deb Fischer, R-Nebraska, Kyrsten Sinema, D-Arizona, and Todd Young, R-Indiana, are also cosponsors. A bipartisan House companion bill is being sponsored by Rep. Terri Sewell, D-Alabama, Rep. Jackie Walorski, R-Indiana, and several others.